Hard to believe the end of this year is just about here! Among other things, I can describe my thoughts as “excited”, maybe! I will save my new year banter for tomorrows post but there is much to contemplate and decide what to write about. Yesterday I was itching to get back into the kitchen and get some baking done! It was around 9:30pm when the desire really kicked in. By the way, I am a night owl. I am most productive at night, especially with baking. I decided we needed a breakfast bread. Hubby has the next 4 days off, although on duty, we are home and can have the luxury of enjoying breakfast together. This bread is a nice easy bread that you most certainly can make the night before, it is actually recommended, but of course you could make it and eat it right away. What I love about this quick bread is it has flavor! I’ve tried & baked some not so good quick breads in my life, the issue they always seem to have is lack of flavor or are like heavy bricks. Not the case with this one. 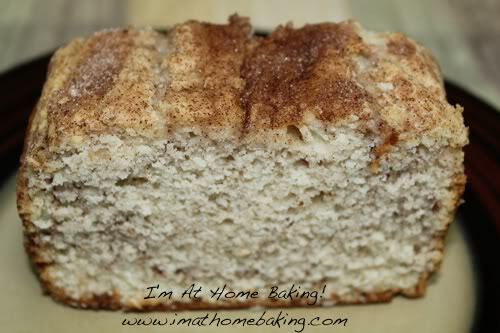 It is very moist, perfect cinnamon/sugar ratio & butter melts like a dream on it! I am sure if you wanted you could add raisins or a nut even. The batter is rather thick and so I would think any added ingredient would suspend nicely. This recipe makes one 9X5 loaf but would come out great as several mini loaves. In a small bowl, mix together ⅓ cup sugar and 2 teaspoons cinnamon; set aside. In a large bowl combine flour, baking powder, salt and remaining 1 cup sugar. Combine egg, milk, and oil; add to flour mixture. Stir till just moistened. Pour half the batter into pan. Sprinkle with half the reserved cinnamon/sugar mixture. Repeat with remaining batter and cinnamon/sugar mixture. Draw a knife through batter to mix cinnamon/sugar mixture or try to marble. Bake for 45-50 minutes, or until a toothpick inserted into the center of the loaf comes out clean. Let cool in pan for 10 minutes before removing to a wire rack to completely cool. I decided to make a double "batch" of the cinnamon/sugar mixture incase it did not provide as much as I liked. I tend to like a lot of it in/on my breads. Yum! My problem too: brick of a loaf! Your picture looks like it’s airy! Maybe if I bake this bread for my husband, I can win him over? 😉 Thanks for stopping by my blog today and offering your words of encouragement! mmmm, sounds delish! I love cinnamon swirls anything! That looks really good, I think I’ll try it! Cinnamon Swirl makes the best sort of bread! Looks delicious! Your bread looks absolutely wonderful!! !